When the world held its breath It is more than 25 years since the end of the Cold War. It began over 75 years ago, in 1944 long before the last shots of the Second World War had echoed across the wastelands of Eastern Europe with the brutal Greek Civil War. The battle lines are no longer drawn, but they linger on, unwittingly or not, in conflict zones such as Syria, Somalia and Ukraine. 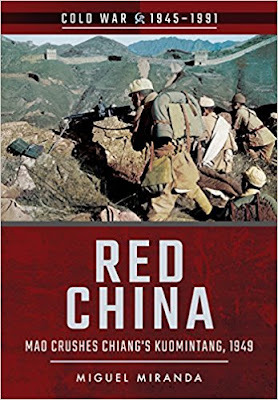 In an era of mass-produced AK-47s and ICBMs, one such flashpoint was China in 1949 China. 1949: two vast armies prepare for a final showdown that will decide Asia s future. One is led by Mao Tse-tung and his military strategists Zhou Enlai and Zhu De. Hardened by years of guerrilla warfare, armed and trained by the Soviets, and determined to emerge victorious, the People s Liberation Army is poised to strike from its Manchurian stronghold. Opposing them are the teetering divisions of the Kuomintang, the KMT. For two decades Chiang Kai-shek's regime had sought to fashion China into a modern state. But years spent battling warlords, and enduring Japan's brutal conquest of their homeland, has left the KMT weak, corrupt, and divided. Millions of Chinese perished during the crucible of the Sino-Japanese War and the long, gruelling years of the Second World War. But the Soviet victory against the Japanese Kwantung Army in 1945 allowed Mao s Communists to re-arm and prepare for the coming civil war. Within a few short years, the KMT were on the defensive while the Communists possessed the most formidable army in East Asia. The stage was set for China s rebirth as a communist dictatorship ruled by a megalomaniac who would become the biggest mass-murderer in history.